to care nothing whatever and effortlessly takes us through four of the most engaging examples of the genre. Actually, she does more than that. She gives a truly amazing performance full of technical challenges interspersed with moments of elegiac beauty, complex ornamentations and deep emotions. She takes each one of those pieces and turns it into a small and precious stone, a concentrated miniature that reveals Vivaldi's genius. The good father from Venice is more famous for his violin concerti but his religious music is finally getting due credit. Still, it is in his operas and profane cantatas where some of the most amazing jewels are hidden. Tone Wik's phenomenal talent helps us discover four of those all too rarely recorded gems. 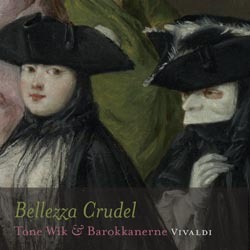 Barokkanerne adds to the program two of Vivaldi's concerti, one for bassoon, one for recorder. Per Hannisdal reveals a dark and raucous bassoon of the highest quality but the true surprise comes from Alexandra Opsahl on the recorder. Her aerial virtuosity is simply phenomenal. It proves that the baroque recorder is a tremendously expressive instrument that certainly deserves a dedicated disk of its own. She actually continues through cantata RV441 in what becomes a beautiful duo with Tone Wik, a splendid marriage of the soprano voice and flute. This is not our grandparents' Vivaldi recording but neither does it wear its period instruments on the sleeve as is too often the case. It strikes the perfect balance between period interpretation, style and elegance - simplification without sterility and a discreet use of vibrato where appropriate.